Forest of a Thousand Lanterns by Julie C. Dao takes the young adult genre into unexpected territory. The setup seems familiar at first: our beautiful, magical young protagonist fights her way from poverty and adversity into a royal court and flourishes against the odds. If you never read the promotional materials for the book or the jacket cover (which I didn’t) then you’ll miss one of the big clues that our hero Xifeng might be anything but: this story is a retelling of the origins of Snow White’s Evil Queen. This knowledge can change the experience of the book; at first I was quite surprised at the dark turns the story takes, not having read any summaries of the book. Ultimately that ties into one of the book’s main themes: free will versus destiny, whether you choose or accept your fate. Knowing who Xifeng turns out to be might take some of the suspense out of the story: whenever she faces a moral decision, do we just inherently know or assume what she will choose, because of who she’s going to be? If the darkness plaguing Xifeng since her birth was supernatural, always inside her without her choice or control, is it really Xifeng making these decisions? Or is it of course Xifeng, because if the darkness has always been present, then it’s always been a fundamental or inescapable part of who she is. Could there be a Xifeng without this darker side, and how much of it is under her control versus a being a sort of demonic possession? 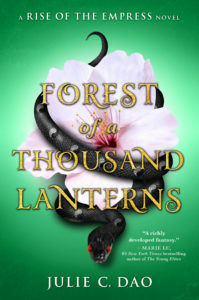 What keeps us gripped to Forest of a Thousand Lanterns, then, isn’t whether Xifeng will keep (quite literally) selling her soul, or if it’s really her making those decisions, but how and why. Xifeng is one of the most fully fleshed out protagonists I’ve read in the young adult genre (and I’ve read many, many YA books). Too often our heroines’ flaws, if they have any at all, range from simple or forgivable to quirky at best (like the adoraklutz). Maybe she’s rash, maybe she’s a worrier; often the only fault given to our heroines is taken right out of Jane Austen’s playbook, and they’re too quick to judge or make assumptions. It would be easy enough to make Xifeng similar: she’s possessed by an evil being, all the readers know she’s going to become the Evil Queen, so she’s just bad because she is. Even if she’s good at the beginning, this thing happens to her and then she’s evil, and that’s the end of it. Dao gives us more than that. Xifeng is an abuse survivor, and it affects her in deeply realistic ways. One kind touch from her abuser is enough to make her (at least partially) forgive years of inflicted pain. Denial of love is what makes her harden her heart to it, and yet desperation for it is what makes her crack open the heart she’s walled off in self-preservation. Multiple characters in the story might have helped turn Xifeng from her inevitable fate, if only she’d truly let them in, truly let herself believe that their love was real or lasting or enough. Ultimately the choices Xifeng makes are on her, and the narrative doesn’t shy away from it. We still grapple with whether her lifelong possession makes her decisions inevitable, but at least we are given more reasons for her behavior than her lifelong possession. We see and feel her struggle, and even if we can’t approve of her decisions, we understand what drives her. The only shame is that I’d love to see a heroine be allowed to have drive and ambition, to reject a quiet life with a man for something loftier, without her being (ultimately) evil. It’s interesting to find our expectations and desires morph along with Xifeng’s journey. First we want to see how Xifeng pulls herself out of her situation and resists evil, then we’re curious of what she’s going to do now that she is. Somehow we’re still, if not exactly rooting for her, invested in her story and journey. Forest of a Thousand Lanterns might not have the most unpredictable plot twists, but it still stands out. If you’re a fan of fairy tale reimaginings, or a fan of young adult novels but are tired of the same character beats or the same constant white, European settings and characters, check out this book and keep your eye on more from Julie Dao, including future additions to the Rise of the Empress series.